I got an email about 6 tons of pureed pumpkin that a fellow needed to dispose of. It was being kept at a cold storage facility, and was packed into one-ton totes. Well, it's getting close to thanksgiving, so I went and got the pie filling. I've talked a lot about calories in pig feed recently, and the best estimate that I can make is that there's 18 million calories in this load of food. The totes are actually really thick cardboard boxes. Here's a top view of the side wall. It has 10 plies of cardboard and is a really strong container. Inside it was packed in an aluminized mylar bag, like an industrial sized wine bag. It's actually a very nice shipping container. Recyclable, tough, holds a lot of weight. The pumpkin is soupy and wet, very liquid. To feed it to the animals I'll probably have to either put the container out in the field and let them feed directly from it, or bucket it out into troughs. One of the pallets had a part of the bag hanging out of the bottom. Shipping damage, maybe. It wasn't pierced, but I decided that I'd feed that one to the pigs first. So I unloaded it from the trailer, took it out to the pig pasture, and set it down. The first pig that wandered over, sniffed the protruding bag a few times, and then took a good bite out of it. That pig was almost knocked down by the stream of liquid pumpkin that came out. It squealed a bit, and that attracted the attention of the other pigs in the area. Pretty soon there's a river of pumpkin and a whole bunch of pigs all lined up eating it. The cows were into the pumpkin too, but I didn't let them eat too much for fear of messing up their rumen. They're almost entirely grass fed, and hundreds of pounds of pumpkin might give then indigestion. The problem I had was that they were pretty excited by the pumpkin, and it was hard to get them to move away so I could pick it up with the tractor. Hilarious story about curiosity nearly knocking down the pig. So 3 million kcal per tote. If a person needs 3000 kcal per day, that would feed a human for 1000 days. How many days will one tote feed your animals? That is amazing seeing pigs knee deep in pumpkin. Nice load of cheap calories. Good that you pulled it back from the cows. I don't know about pumpkin, but I know too many apples will ferment in a cows rumen and get them drunk. Nice pictures. Those cows going at it are pretty cute. The knee deep pig was pretty cute too. I have heard that pumpkin is a really nice way to put weight on pigs. How long will it feed your pigs? And will you also have to refrigerate the containers not being eaten at the moment? Ok, i'll confess i was just guessing about the pumpkin calories. I tried looking it up on the net all of the calorie conversions were for a small quantity of pumpkin, like a cup, and that's a measure of volume, not weight, and I was too lazy to complete it. but a cup of sliced pumpkin (230ml) is 30 calories, and the tote is 48"x40"x48" and full to the brim. so it's a lot. my 40 big pigs ate one of the totes yesterday. The whole thing. all of it. That's roughly 50lbs of pumpkin per pig. They were waddling around this morning. The smaller pigs ate about 1,000lbs of it. The air temp at the farm is 35-40f at night, 50-60 day. Given this rate of consumption, it'll all be consumed in 3-4 days, so I'm not too worried about refrigeration below what nature supplies. If it does spoil I'll compost it. Won't that big of a change in diet make them sick? I know when I was a kid my parents fed our two pigs potato culls from the garden. Nearly killed the pigs. Vet came and drenched them with a soda bottle filled with a milk of magnesia solution. My mom had to keep giving that to the pigs for a day or two. It was no problem, the pigs were too sick to move. We knew they were better when they couldn't be caught any more to give the treatment. The vet told my mother not to make any quick changes in diet like that again. At least the pumpkin is cooked though. The vet said cooked vegetables were more digestible and safer to give to pigs. Weird how I still remember that from decades ago. Must have made a big impression as those pigs were our winters supply of meat and almost losing them when they were nearly ready to butcher was a big deal. Sheila - I wonder if it might have been the potatoes that were the culprit, more so than the change of diet. This page suggests that raw potatoes in large quantities lead to stomach problems in pigs due to an overload of indigestible starch. He lists references that support this explanation. Can you blog about how you find all this free feed? Perfect, desert before dinner, totally works for me. lol Looks delish!! Robert - when you have pigs and people know you've got them, people with food waste want your pigs to make it disappear, because the alternative, disposing of it as garbage, costs so much money these days. That's what is miraculous about pigs; they eat food that, but for pigs, would be waste. One of the absolute very best pigs we have ever eaten, was feed left over whey from the cheese plant in Orting, Wa. about 30 years ago. 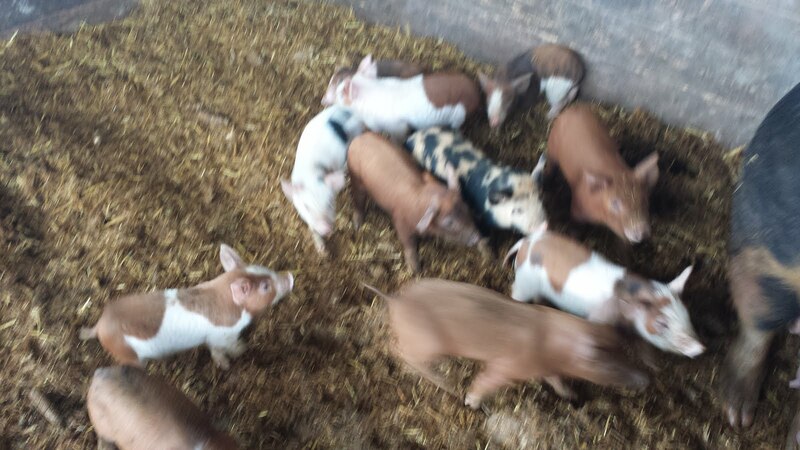 Our friends had a few pigs, and they had access to the whey and we talked about how good those pigs were for years! So how were the "pumpkin pigs"? Pretty darned tasty. I think that pigs fed a lot of vegetables (pumpkins, in this case) have a great flavor. that's why I try to include as much fresh fruit and veges in their diet as I can. My "stupid chicken-eating dog"-progress report.